ST. PETERSBURG, Fla. -- Minor League Baseball announced today it has selected Cleveland Indians Minor League field coordinator Tom Wiedenbauer as the recipient of the seventh annual Mike Coolbaugh Award. The award was created by Minor League Baseball in 2008 to honor the late Mike Coolbaugh, long-time professional baseball player and coach. Mike spent parts of two seasons playing in the Major Leagues and parts of nearly 20 seasons with Minor League Baseball teams, including separate stints in the Texas League as a player and coach. The Mike Coolbaugh Award is presented annually to an individual who has shown outstanding baseball work ethic, knowledge of the game and skill in mentoring young players on the field. Wiedenbauer will receive his award at the Baseball Winter Meetings Banquet on Sunday, Dec. 7, at the Hilton San Diego Bayfront in San Diego, California. "I am deeply honored to be the 2014 recipient of the Mike Coolbaugh Award," said Wiedenbauer. "Having had the opportunity to get to know Mike personally, this award has special meaning to me. It is humbling to join the list of prior recipients and I owe a special thank you to the Cleveland Indians for allowing me to work in a productive and fulfilling environment. I would also like to thank Minor League Baseball for their continued involvement in carrying on Mike Coolbaugh's legacy." Wiedenbauer began his baseball career in 1976 when he was drafted in the seventh round by the Houston Astros as an outfielder before converting to a pitcher in his final two seasons. He owned a career Minor League average of .250 in 636 games and compiled a 10-11 record with a 5.00 ERA and two saves in 45 games (21 starts). Tom made his Major League debut with the Houston Astros in 1979 and played in four big-league games, producing four hits in six career at-bats with a double and two RBIs. After playing eight seasons of professional baseball, Wiedenbauer began his coaching career in 1984 as the outfield/baserunning instructor for the Houston Astros. His managerial stints included managing the Osceola Astros in 1986 and the Columbus Astros from 1987 to 1989. In 1990, Tom became the outfield coordinator for the Houston Astros, where he spent three years of his career before becoming the field coordinator in 1994. In 1997, Wiedenbauer became a Major League scout for the Houston Astros. After spending three seasons in that role, Tom moved back to the field coordinator position for the 2001 through 2008 seasons. In 2009, Tom returned as a professional scout for the Houston Astros and remained there until the completion of the 2010 season. In all, Tom spent 35 seasons with Houston, serving as a player, coach, manager, coordinator and professional scout. 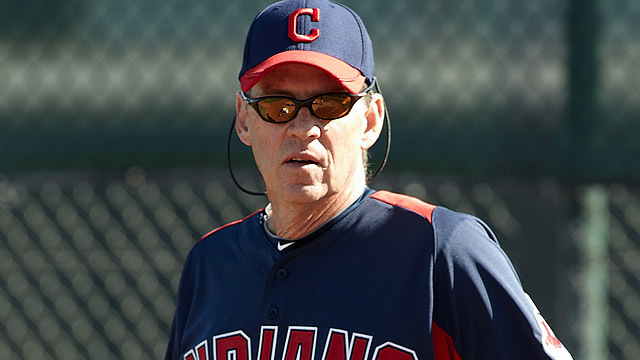 Tom joined the Cleveland Indians in 2011 as the Minor League field coordinator. He was brought up to Cleveland in 2012 to serve as the team's first base and baserunning coach, and returned to the role of fField coordinator in 2013. The 2014 season marked Tom's fourth season with the Indians, and 14th season as a field coordinator. As the field coordinator, Wiedenbauer provides leadership on the player development department's systems, policy and direction while leading the field staff in the process of maximizing each player's individual potential. "On behalf of the Cleveland Indians, I congratulate Tom Wiedenbauer as the recipient of the 2014 Mike Coolbaugh Award," said Cleveland Indians general manager Chris Antonetti. "Through his tireless work ethic, broad perspective, patience and positive outlook, Tom has impacted hundreds of players and staff members throughout the game. He truly embodies the spirit of the Mike Coolbaugh Award, and we are honored to have him as a leader in the Indians organization." "Each year, we recognize one individual who exemplifies the principles and values that Mike represented both on and off the playing field, and Tom is certainly deserving of this recognition," stated Pat O'Conner, Minor League Baseball President & CEO. "I am honored that we are able to pay tribute to Mike's legacy through this award, and on behalf of Minor League Baseball, I congratulate Tom on being selected as this year's recipient."